When a study was done with hidden cameras near clusters of mailboxes, researchers discovered 97% of people opened a handwritten letter first. (The only mail that occasionally trumped a letter was a check.) Not surprisingly, bills were often opened last. Ah, but how often do we receive a handwritten letter in this day and age? 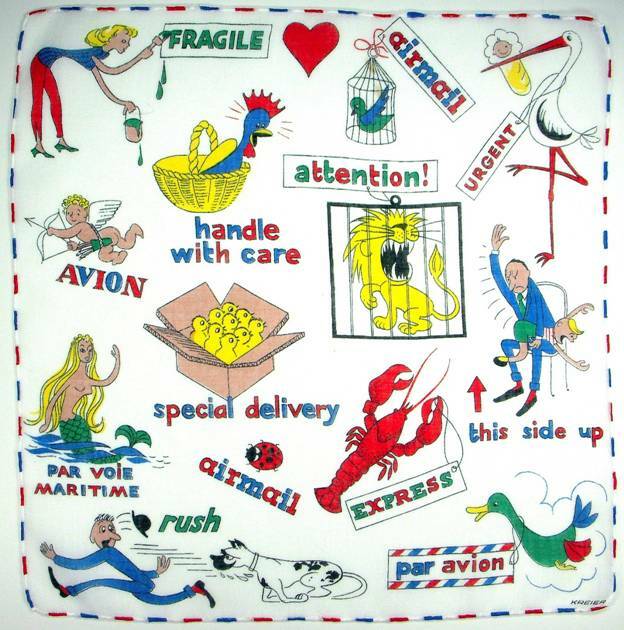 This children’s handkerchief celebrates the joyful arrival of the postman. 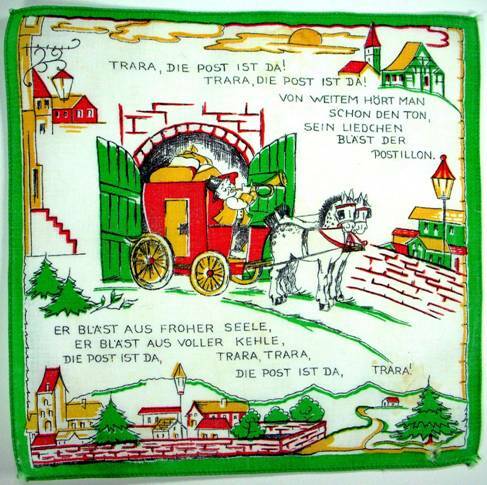 The happy song explains that from a distance you can hear the horse’s hooves and the joyful blast of the postman’s horn. Depending on your age, you may remember how exciting it was as a child to receive a birthday card or special greeting in the mail. Surprisingly, it may seem even more special to receive a handwritten missive as an adult, as you’re now well aware of how our hours can fill and days disappear. Knowing someone took special time from their busy schedule to focus just on you makes the message all the more cherished. 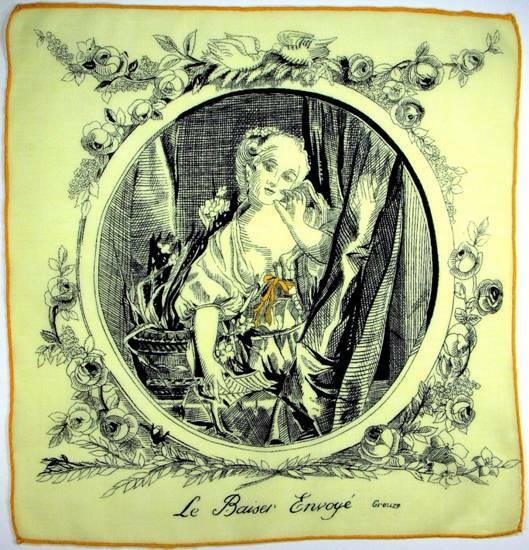 The handkerchief above depicts a pen and ink rendition of “Blowing A Kiss” based on the 18th Century painting by Jean Baptiste Grueze. Described as “a lady en dishabille holding a letter at a window,” it appears her beloved penned a love letter before departing, and perhaps left it on her pillow.She holds the note in one hand, while appearing at the window to offer a last good-bye kiss. 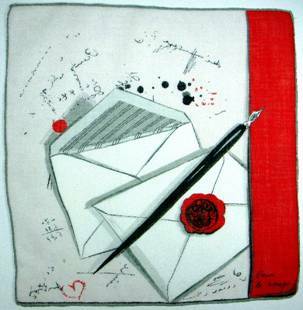 What a lovely hankie to either give or receive. 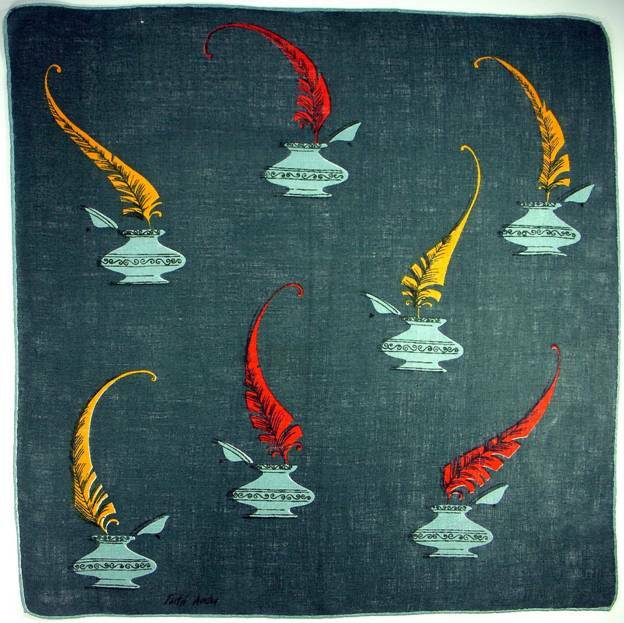 In those days pens were carved from feathered quills, as these handsome handkerchiefs attest. Note the handclasp reaching across the miles. 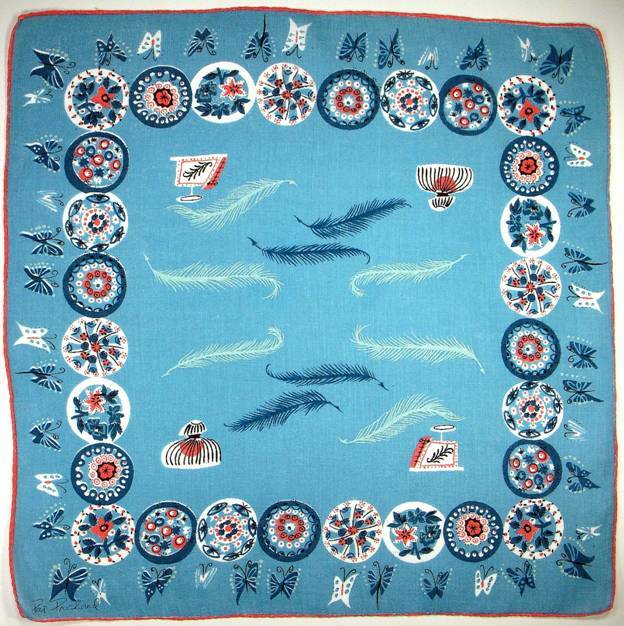 For some reason this handsome gray hankie with brilliantly colored quill pens in inkwells brings to mind the signing of the Declaration of Independence. Quills and letters “Pour les Tendres Messages” on the left, and sealed with loving hearts on the right. 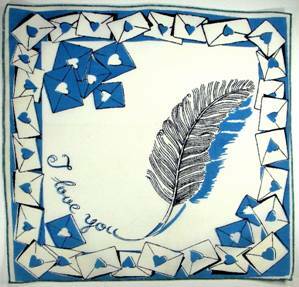 Handkerchiefs were such popular gifts for both acquaintance and loved ones, it’s not surprising we find so many that contain images of affection. 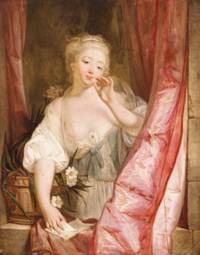 Often, when leaving a good-bye kiss on a letter, a lady would apply extra lipstick to ensure her lips left an indelible impression. 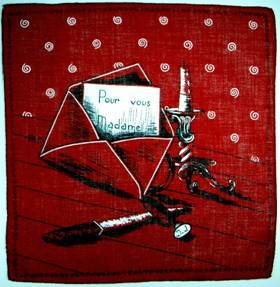 Afterwards, a hankie was required to blot her ruby reds. 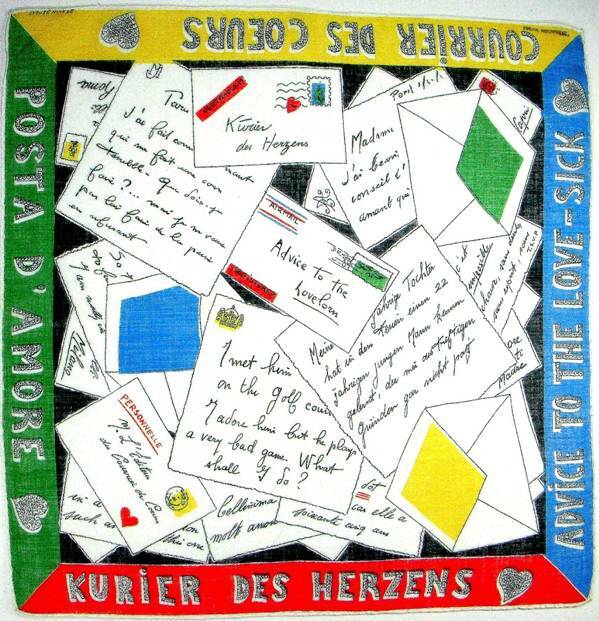 Kissing a letter was so common,love letters became a favorite theme of the lipstick handkerchief. Pearls, love letters and the ace of hearts, juxtaposed alongside a claret hued love letter, sealing wax, candle, and letter opener. 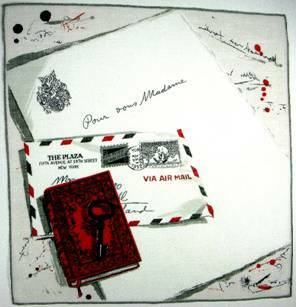 Stationery from The Plaza awaits the penning of a love note, while alongside we spy a desk blotter with sketches of hearts and a note affixed with sealing wax. 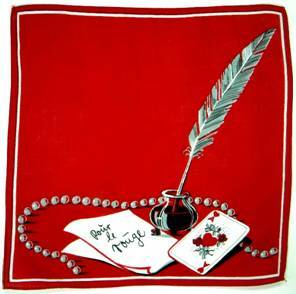 The red strip on the right reads “Pour le Rouge” leaving no doubt this is a lipstick handkerchief. “Your letter – your dear, warm, true-hearted letter – was put in my hand. In Pat Conroy’s book My Reading Life, the author writes of meeting Archibald Rutledge, poet laureate of South Carolina at his Hampton Plantation home. “His handwriting looked like jasmine weaving through a trellis.” What a great metaphor. He goes on to describe Spencerian script “like bold and graceful dancers or the billowed sails of a schooner running leeward in a heroic seascape.” Wow. “But we’ve lost all that,” he laments. “Now the letters look like school children in simple rows.” Indeed. We lost character and personality when we lost the art of handwriting. The fehlschuss in fluffy skirt and flouncy hat may appear to be penning a letter nonchalantly, but her words say otherwise. Seven days she has been waiting for him and can’t help but wonder how long it has been since he has thought of her? I could be their leader. Perhaps she envisioned a thunderstorm of love letters for her intended, much like the shower we witness below. 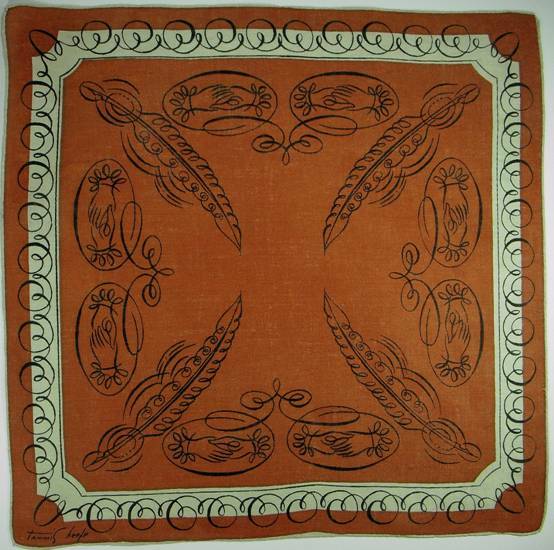 Can you guess my favorite thing about this hankie? The image is superb, but the detail of the teensy airmail border is what takes it over the top for me. Details like this raise the hankie one notch above the others. When you think about it, it’s pretty amazing that 26 little letters can join in endless combinations to spell love, passion, heartache, happiness, and more. Long live the alphabet! The variety of type fonts almost resembles the variety of stamps you can find on the envelopes. What a terrific royal blue border resplendent with cancellation stamps. 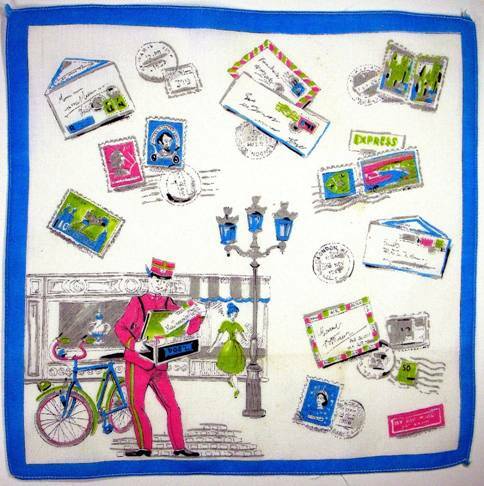 Perhaps it’s the street lamp, or French bicycle messenger, but this next hankie brings to mind the suspense thriller Charade, filmed in Paris, starring Audrey Hepburn (as Reggie Lambert) and Cary Grant (as Peter Joshua). With her husband found murdered, Reggie is being chased by his three pals, all of whom were in on a plot to steal $250,000 in gold meant to support the French Resistance, but which they kept instead. Reggie has no idea where the money is. All her husband left was a letter addressed to her, a ticket to Venezuela, and multiple passports. Everyone overlooks the obvious – THE STAMPS on the letter. Her husband converted the gold to priceless collectable stamps – much easier to transport, and more difficult to detect. 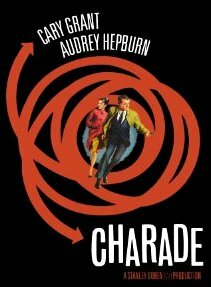 To enhance your viewing, Henry Mancini’s terrific theme song from Charade. 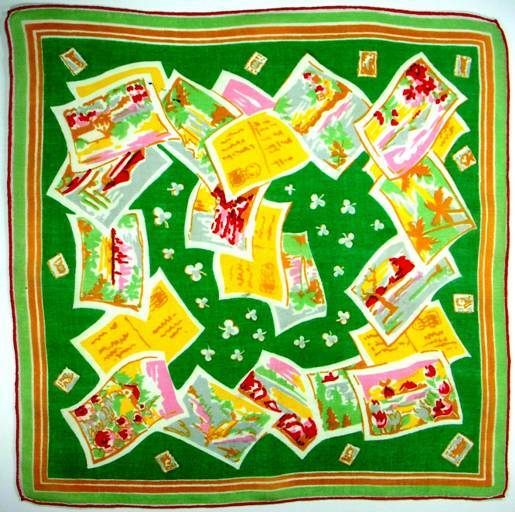 This handkerchief reveals that Stamp Language is based on love and friendship. If you think stamp images are insignificant, you’ve never been in a post office line behind a stamp afficianado. Check the next wedding invitation you receive – I’m willing to wager the stamp’s subject is love. Even if only a postcard, we’re happy to know someone is thinking of us. 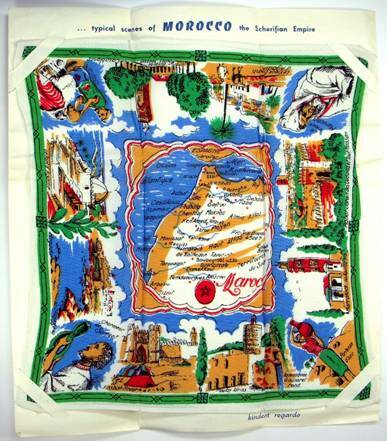 This 1956 letter from Morocco contains a silk crepe souvenir handkerchief. Ribbons hold the hankie secure at the corners. 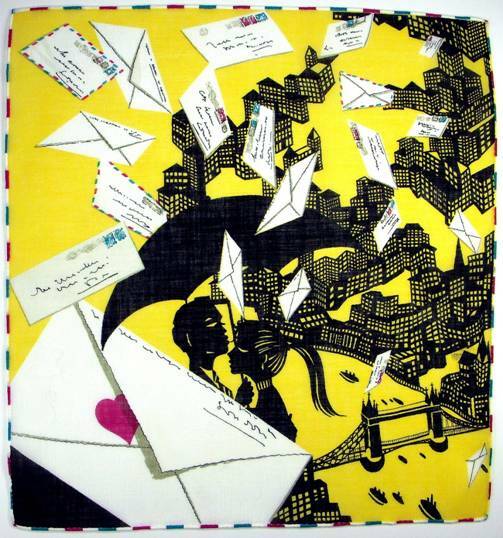 Once folded, there is a designated place for the letter – in this case, a charming love letter. Note the French spelling of correspondence. 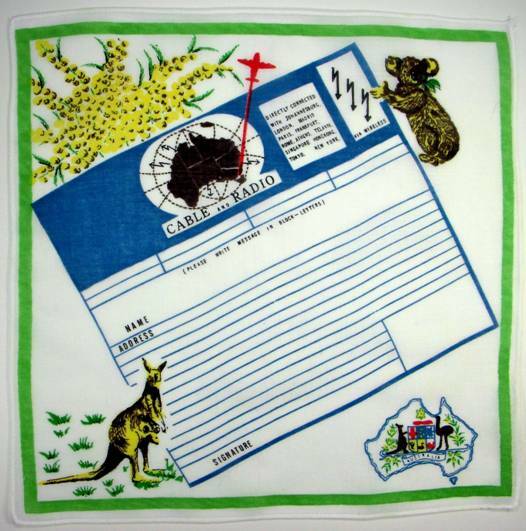 Another fun souvenir hankie, this time featuring a cablegram from Australia. Before the internet or expensive transatlantic phone calls, cable was the most expedient way to convey a timely message. 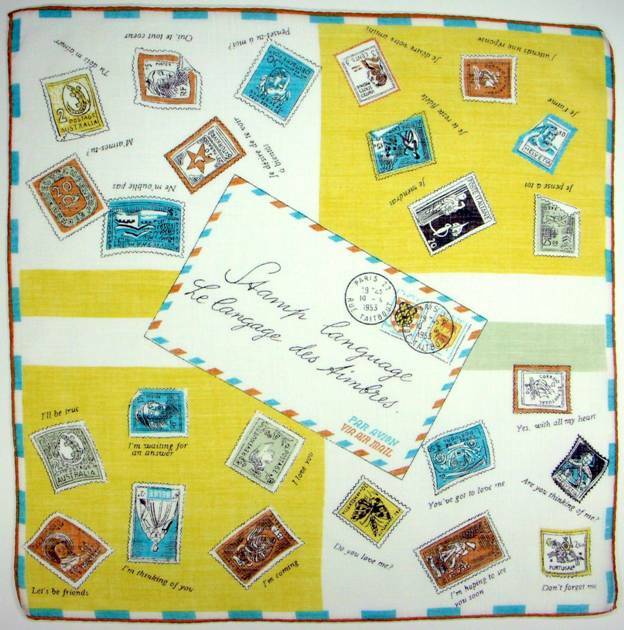 Whether postcard or package, whether shipping by air, land, or sea, man will always find a way to transmit his intended message, as this next hankie so aptly illustrates. 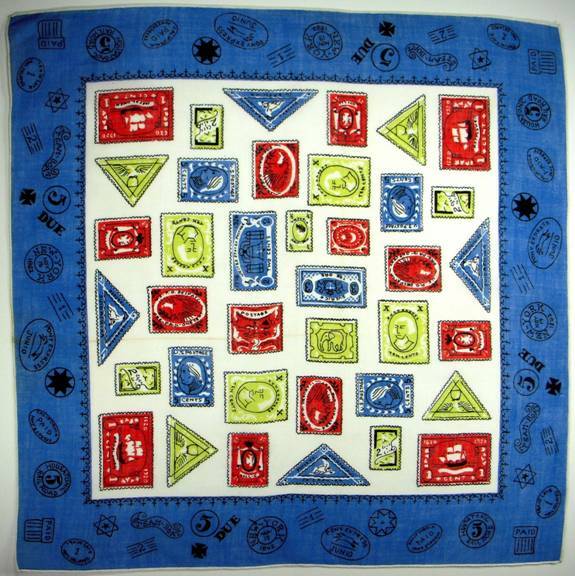 The hankie above is so colorful and fun we had to add two terrific tunes to accompany it. This lady’s writing desk contains all the essentials – blotter, ink well, quill pen, candle for sealing wax, stamps, poetry books for inspiration, pictures of the beloved, albums, folios, and paperweights. 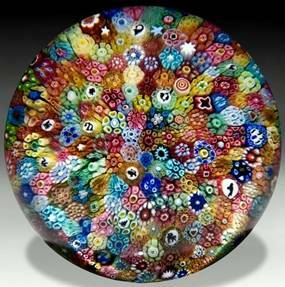 But not just any paperweights; these are millefiori, or ‘a thousand flowers’ paperweights. 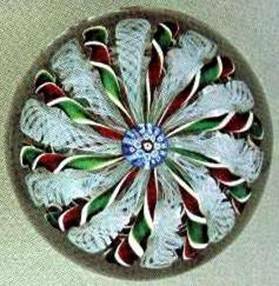 Early collectors of millefiori paperweights included Queen Mary, Queen Victoria, and Napoleon III’s Empress Eugénie, among others. Today, there are an estimated 20,000 collectors. 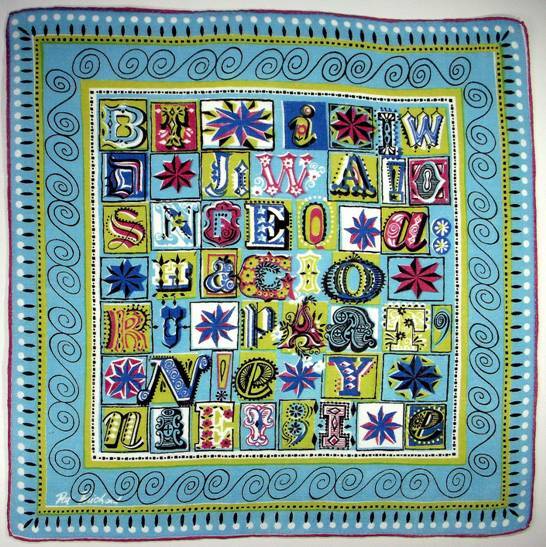 The colorful and intricate one-of-a-kind paperweight designs allow for a variety of graphic interpretations on handkerchiefs. Ink wells and feather quill pens bordered by a collection of millefiori. Although the technique has been around for 2,000 years, it wasn’t until around 1840 that millefiori was used in paperweights. Three of the largest private collections (one of which contains over 2,200 specimens) can be found in the United States. The tiny black and white rods you see in the paperweight on the right contain signs of the zodiac. Are your haunting ghosts tonight. Q: What role did Vicks VapoRub play in U.S. postal history? The longest Main Street in America is located in Island Park, ID and is 33 miles long. The longest rural mail delivery route is Route 081 in Mangum, OK, where the carrier travels 187.6 miles each day (!!) and delivers to 240 boxes. The most unusual mail delivery method involves mule train deliver in Arizona. Each mule carries 130 lbs. of mail, food, supplies and furniture down the 8-mile trail to the Havasupai Indians at the bottom of the Grand Canyon. The mule train averages 4,000 pounds of materials each day. Other unusual delivery – Boat delivery on the Detroit River in Michigan. The JW Westcott is a 45-foot contract mail boat that delivers mail to passing ships. The boat has its own ZIP code – 48222. Wow! Amazing, as always! Ann, all of these need to be in a book! Happy to read this one! It has inspired me to write a few messages to friends and family!. How cool is that! Please do send this along,as I’m sure they’ll get a kick out of it. 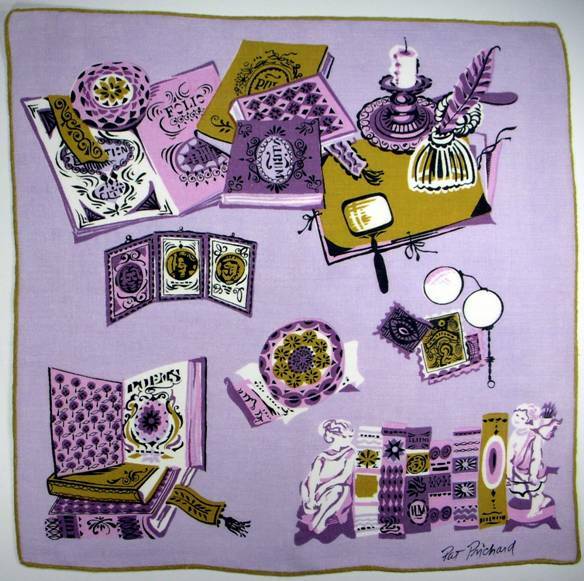 What a wonderful surprise to learn of your superb talk on Hankies, as I had also great memories of you from decades ago with handwriting – and surely must have your book hiding at the time. 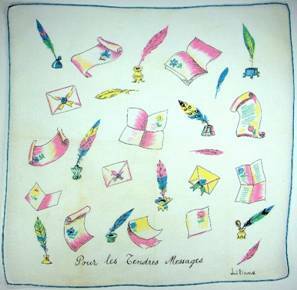 Sunday morning I even found a dear white hankie with pink diamonds appliqued beautifully! Yours looked cotton crisp where appropriate so now I have much to learn. Your email details – great generosity of a true educator – loving to learn and sharing. 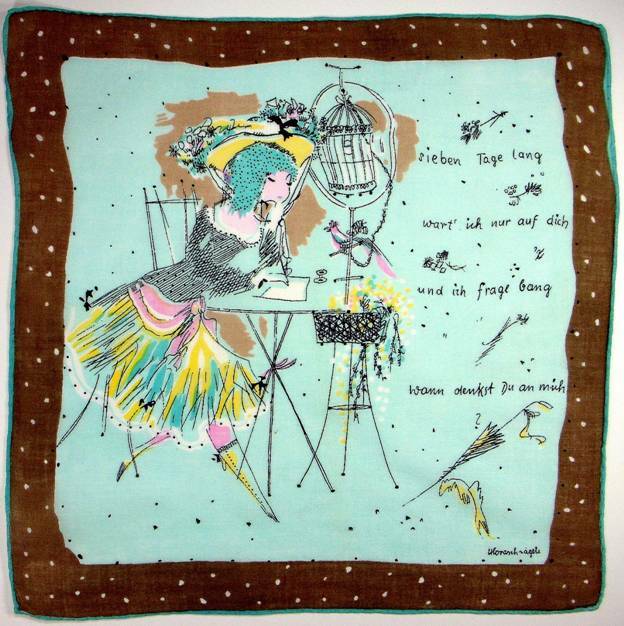 YOUR HANKIE STORIES are full of joy and memories -THANK YOU ANN! 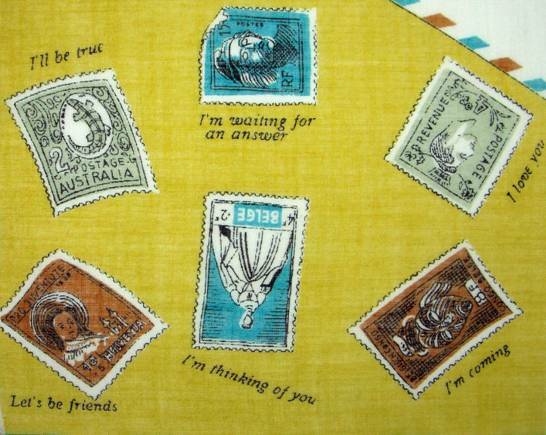 Your postage hankies – a delight for I have had my Japanese pen pal since we connected at age 13 years, 3 days apart. We still love to send each other cards with all sorts of thoughtful stamps. Packages to Ireland also had oodles of celebratory stamps. Now to mail cards before Thanksgiving! 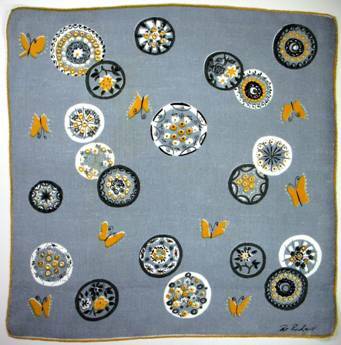 Thank you again sincerely for a tremendous talk for the Textile Arts Council. Just reviewing some work and came across your kind comments to my blog on writing and postage. Only now did I realize I never responded to thank you for your kind words. It does make a difference and it keeps me going in my quest to preserve these artifacts for future generations. Mea culpa on my tardiness and Merci to you.